DAMMAM MINA KHALIFA, DOHA, KUWAIT, BANDAR ABBAS, MUSCAT. 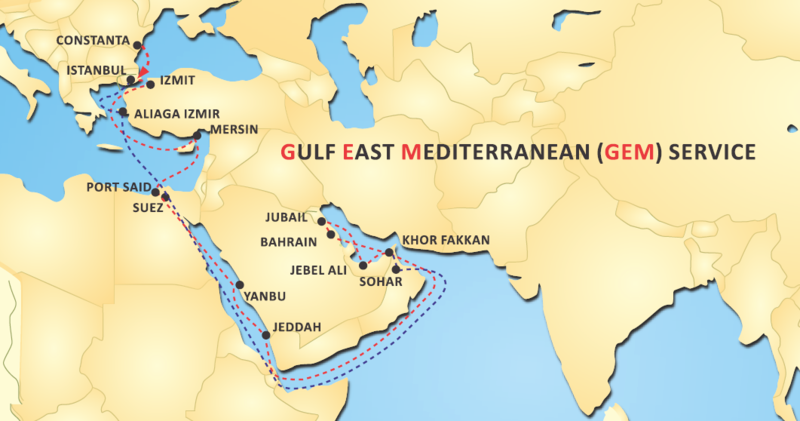 JEBEL ALI, KHORFAKKAN, DAMMAM, SHUWAIKH, DOHA, BAHRAIN, ABU DHABI, MUSCAT. The transshipment port is PORT KELANG (Malaysia). From here are made weekly departures towards the final destinations. Container’s transshipment from GEM service towards CONSTANTA is made in ISTANBUL (Turkey).